From Narendra Modi to BJP President Amit Shah hold rallies in Uttar Pradesh and Uttarakhand. LS Polls Live: Ahead of Lok Sabha elections, Hyderabad police has seized Rs 9.45 crore cash, freebies worth Rs 3.73 Lakh, gold Rs 9.15 Lakh, 135 litres of liquor, 40 kg cannabis and 11 bags of gutkha this month. LS Polls LIVE: I’m pleading with you don’t believe PM’s colorful words.Why should we have enmity with neighbouring countries? 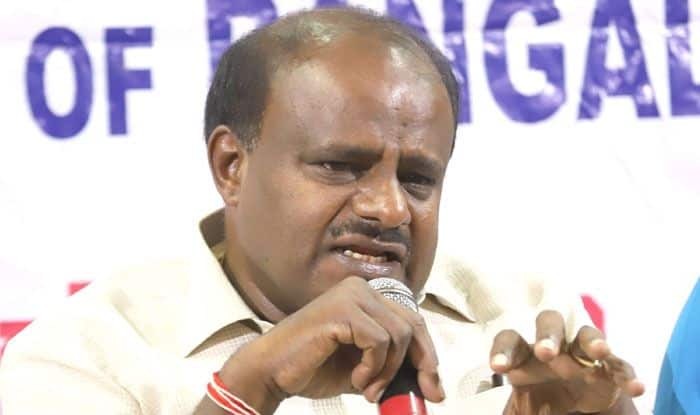 2 yrs ago a military officer told me PM will build a story before election to get votes.They don’t ask for votes on development work, says Karnataka CM HD Kumaraswamy. LS Polls LIVE: Launching an all out attack on PM Modi, Congress General Secretary for UP East, Priyanka Gandhi Vadra said,”He roamed all around the world but never hugged a poor family of Varanasi.” “Dunia bhar ghoom aaye hain. Japan gaye wahan gale lage, Pakistan gaye wahan Biryani khaayi, China gaye wahan gale lage. Lekin Varanasi ke ek gareeb parivaar se gale lagte dekha hai?,” said Vadra. LS Polls LIVE: A Congress delegation comprising Ahmed Patel, Randeep Surjewala, Abhishek Manu Singhvi and Jairam Ramesh reaches Election Commission of India. LS Polls LIVE: ‘Mauni baba’ Manmohan Singh was the Prime Minister for 10 years. He went to the Rajya Sabha via Assam. I would like to ask Rahul Gandhi, you speak loudly from stage, why don’t you give an account for your 10 years of governance, said BJP President Amit Shah in Assam’s Morigaon. 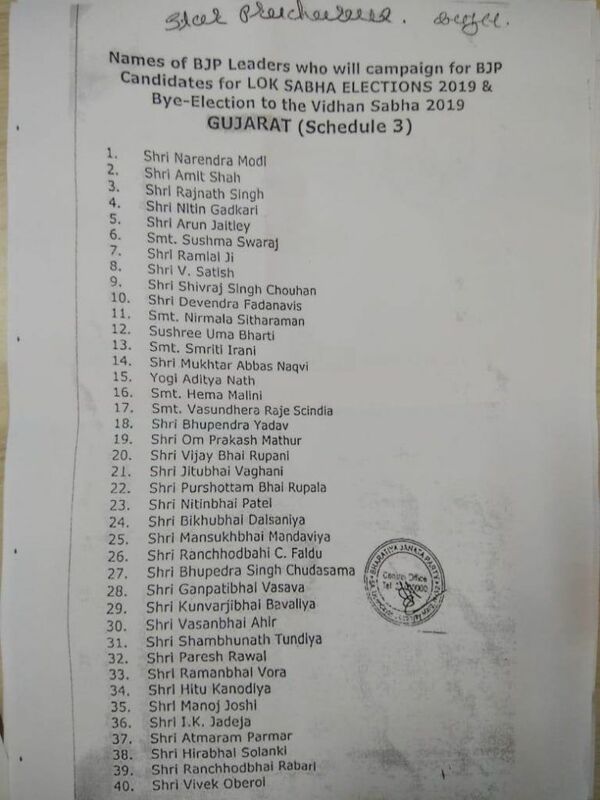 LS Polls LIVE: BJP releases its list of star campaigners for Gujarat. The list also has the name of Bollywood actor Vivek Oberoi, who is playing the role of PM Modi in the biopic ‘PM Narendra Modi’. New Delhi: Prime Minister Narendra Modi addressed a rally in Uttar Pradesh’s Amroha on Friday morning. He is scheduled to address another rally in Uttarakhand. In a statement released by the party, the BJP’s Uttar Pradesh unit had said PM Modi will address the rallies in Amroha and Saharanpur parliamentary constituencies in order to support the party candidates. While Saharanpur will vote on April 11, Amroha will vote on April 18. BJP president Amit Shah held a public meeting at Namsai in Arunachal Pradesh 9:30 AM at General Ground, Bordumsa, Changlang district in the state. Shah addressed an election rally at Wangjing Kodompokpi Lampak, Thoubal district in Manipur. He will hold another public meeting at 3:30 PM at the Ahatguri Mahjuj Playground, Jagiroad, District Morigaon in Assam. Not just BJP, Congress leader Rahul Gandhi interacted with students today. Students from Bharati Vidyapeeth and other colleges were invited for the interaction. Rahul Gandhi is on his two-day Maharashtra tour. Apart from interacting with students, he will undertake rallies at 2 PM and 4 PM respectively in Chandrapur and Wardha. “We are trying to organise a rally in Nagpur too. But on April 5, Bahujan Samaj Party (BSP) chief Mayawati has booked the most sought after venue of Kasturchand Park for her rally. So, we may have to hold our programme at some other place,” said a leader. Congress leader and MLA Vishwajeet Kadam are involved in framing Rahul’s programme in the city. Congress General Secretary for East Uttar Pradesh, Priyanka Gandhi Vadra will also hold a roadshow in Ghaziabad today. The SP-BSP-RLD alliance will hold their first joint rally in Deoband on Sunday. All three party chiefs – Akhilesh Yadav, Mayawati and Ajit Singh will address the rally. Priyanka Gandhi will hold a roadshow in Ghaziabad in support of Congress candidate Dolly Sharma. Trinamool Congress (TMC) chief Mamata Banerjee will address an election rally in Assam’s Dhubri district today itself. TMC is contesting nine of the state’s 14 Lok Sabha seats this time in the backdrop of protests against the National Register of Citizens and the Citizenship Bill.